Definition at line 596 of file vm.cc. Definition at line 600 of file vm.cc. Definition at line 628 of file vm.cc. References Var::defined, StreamDecorator::E_WARNING, Vm::fileName, VarSet::size(), Var::used, and vm. Definition at line 638 of file vm.cc. 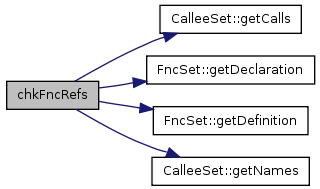 References CalleeSet::add(), Vm::calleeSet, Var::defined, StreamDecorator::E_WARNING, Vm::fileName, CalleeSet::getCalls(), CalleeSet::isCalled(), Var::name, FncDeclaration::self, and vm. Definition at line 653 of file vm.cc. References Var::defined, StreamDecorator::E_ERROR, StreamDecorator::E_NOTE, Vm::fileName, CalleeSet::getCalls(), FncSet::getDeclaration(), FncSet::getDefinition(), CalleeSet::getNames(), hasError, Token::lineno, FncDeclaration::self, and vm. Definition at line 676 of file vm.cc. 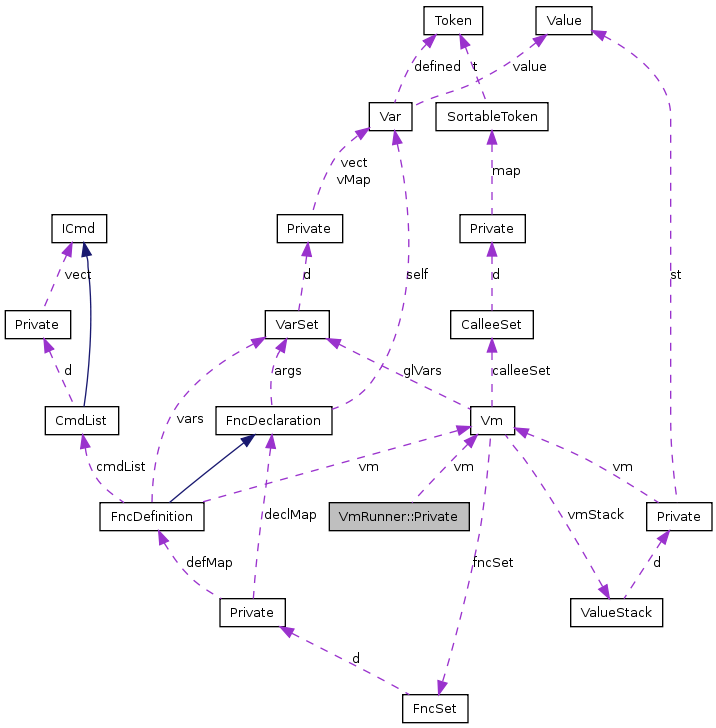 References CmdFactory::createCall(), StreamDecorator::E_ERROR, ETOKEN_ID, ICmd::exec(), Vm::fileName, ValueStack::isEmpty(), vm, and Vm::vmStack. Definition at line 597 of file vm.cc. Referenced by chkFncRefs(), chkUnusedFncs(), chkUnusedGlVars(), and run(). Definition at line 598 of file vm.cc. Referenced by chkFncRefs(), VmRunner::hasError(), and VmRunner::run().